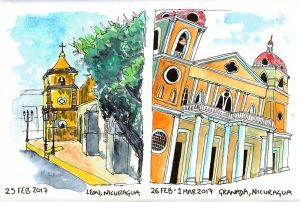 Nicaragua | Travel sketching & Illustration - Explore My Sketchbook! I did not intend to visit Nicaragua but after my scuba diving plans went south I got in touch with my new best friend Leah, who I had met on my first evening in Guatemala and she encouraged me to come and meet up with her. 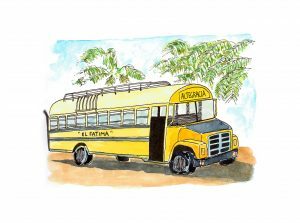 It involved another 15-hour slog in a minibus but it was totally worth it, (a) to see a good friend (even though we had only known each other a couple of weeks) and (b) because Nicaragua is not somewhere to miss! 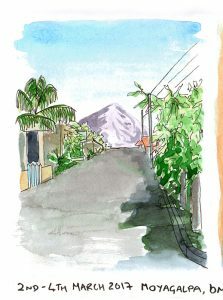 The architecture and food in Granada and Leon are fabulous, along with an awesome visit to a volcano, staring down into a fiery pit of lava and topped off by a few days in the island of Ometepe, formed by two volcanos in the middle of Lake Nicaragua. It’s a spellbinding country.